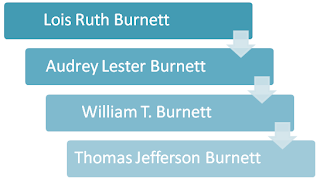 Thomas Jefferson Burnett is my third-great grandfather on my father's maternal side. He was September 20, 1835 in Henry County, Missouri to Isham and Anna (Hall) Burnett. He was the tenth of thirteen children. Isham and Anna Burnett were originally from Virginia and migrated to Missouri prior to 1820...it would have still been a territory when they arrived. The Burnetts were farmers and Isham owned his own land in Henry County, which is just north of I-70 close to Columbia. He then owned land in Henry County, which is closer to the western side of the state. By 1850, Isham Burnett has died and Anna Burnett has moved the family to Warrensburg, Missouri. Her family owns land and her oldest sons appear to run it. On March 24, 1858 Thomas Burnett married Harriett Potts. The couple had 8 children. Harriett died in infancy and Mattie died at age three. Thomas served in the Civil War, and eventually received a pension from his time assigned to Company B, 27th Missouri Mounted Infantry. This amount of service was only for 5 months, however Thomas' obituary states that he "gave some of the best years of his life" to the Civil War. I'm not sure if that indicates service in more than one unit or just a writer's embellishment. It is possible that he may have served in several units. The family lived in Henry County and Cass County before settling in Johnson County. Thomas was a farmer by trade and also served as Justice of the Peace for several years. He died March 13, 1905 in Kingsville, Missouri and was buried in Kingsville Cemetery, Kingsville, Missouri. Like most of my third-great grandparents, I do not know much about Thomas Burnett the man. I can assume that he was forced to become a man early in life due to the early death of this father. He was certainly a well-known man in his community. 1. Research his military service to clarify dates. 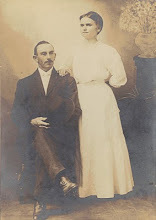 This post is part of my on-going goal of 2013 to research each of my 32 3rd great-grandparents more in-depth. Thomas is #9 on my list.